I had a holiday tradition for many years of putting together a colourful and picture-filled family newsletter. In many ways, it became a bit of a family archive of what had happened that year. As I sit here and type this I am realizing how much I miss it. I'm not sure what the newsletter would look like this year as it has been very different year. There is one image that jumps out to me of capturing the essence of what happened in May, and everything that has followed since the evacuation of our community. It was a selfie taken by Heather and they got in the car and began their slow crawl north to the safety of Fort McKay and Barge Landing Camp. I still have a horrible feeling in the pit of my stomach looking at it, deep remorse that I wasn't there to help, protect and hold them. I know that hundreds, if not thousands, had a similar sort of experience on that crazy day; being separated from loved ones. 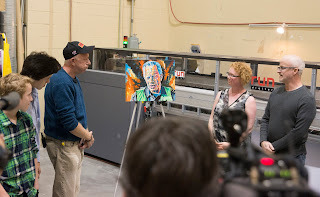 Another image that is deeply meaningful to me is the one of Fire Chief Darby Allen seeing the painting I did for the first time. It seemed to be the apex of media attention as three or four television stations and several newspaper reporters converged at Run Digital in Calgary to witness the unveiling. Being surrounded by my family meant the world to me in that moment. Heather and I came back to the community at the first possible opportunity; it was June 1st. I'm so glad we were able to experience the ghost town feel of an almost empty community, then observe it slowly come back to life over the summer. It was an experience that I will never forget. As Christmas approaches, I'm furiously trying to get commission requests completed. In a sense, I feel a little bit like an elf, working away in Santa's Workshop, focused on making holiday dreams come true. I'm looking forward to finding some time this weekend to focus on my family, and creating and/or finding a few surprises for them, too. I'm going to look back on 2016 with a sense of nostalgia and a pile of emotions. I've remained mostly stoic through this great journey. However, below the surface are a lot of feelings, lingering trauma, and a few blank spots. Again, I know that I'm not alone. Everyone who experienced the Fort McMurray fire, either as an evacuee, a first responder, or countless others who contributed to the response, will be dealing with its after effects for a long time.